Smitaki: January 27 - May you be happy? January 27 - May you be happy? 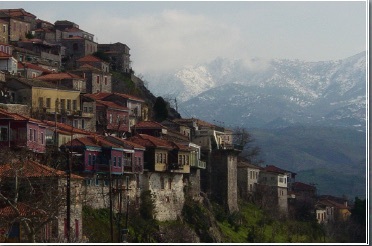 The white tops of the Lepetimnos mountains tower over the north of the island. Nestled against the mountain, the medieval village of Molyvos, which consists of houses of dark stone with colourful wooden extension is given the look of an Afghan mountain village, exotic and mysterious, by the snowy mountains. The harbour offers a splendid view of this rare scenery because winters on this island are not always provided with a white blanket. It is marvellous to linger some time there in the harbour where all the boats are tight up at the quays. A fisherman busies himself in his kingdom and volunteers walk up and down, some busy with work to do, others at an easy pace waiting to be called to action. The sun is as strong as in spring and warms the bones that have suffered so much with the intense cold of the past days. Conversations always roam around the subject of the refugees. What else should one talk about here, in what some call a war zone. And while my body purrs with pure happiness because of the heavenly warmth, the wheels in my brain whirl around, becoming red when a subject passes that agitates me. The stupid political world-theatre makes me feel powerless and angry. Here on the island you can find the new world, that politicians refuse to see. Instead of the bankrupt state or the failing Europe, hundreds of volunteers have come to act. While the Schengen borders are being closed, they cross borders because they have lost faith in the politics and have decided to act themselves. Meanwhile boats with refugees keep on coming, their timetable not altered by any storm or snow fall, even though some arrivals are a disaster and not everyone reaches safe ground. It is difficult to choose: shall I make a fuss during a discussion or shall I surrender to the feeling of happiness caused by the warmth of the sun. Much of the time I no longer know what to do with my feelings. When I watch out over the sea, I feel love for this superb surface, that each day offers different views and produces such good food. When a fishing boat passes over the horizon, life seems to be good. But when I see a piece of refugee garbage I realize that the clear splashing water is also a silent killing machine. The fish are no longer the only ones swimming in the sea. When the sea, as it has recently, is fuming with rage and engulfed in layers of foam, I admire the metamorphosis; then my thoughts take an ugly turn when I remember that people are forced to cross this raging mass to find a safe home. When the sun takes up her palette and paints the clouds pink and the white mountains ruby red, I can suddenly feel a fear rising for the coming darkness, the perfect cover for illegal sea crossings. When the friendly smiles of the first anemones appear, your thoughts wander towards the approaching spring, the time that the island will be covered with flowers; but a slice of fear comes up too: am I supposed to enjoy this season, while so many people fight for their lives? While I snuggle under my comfortable warm blankets, I think of the mud and the tents blown away by a storm in camp Moria and I reach for a book to forget. When I watch over the pure blue sea and see a bright coloured dinghy passing by and the street fills with all kind of cars, I bow over my computer to continue my life. When I joyfully sing while preparing nice scented dishes, I know that when the guests arrive, the atmosphere will inevitably change because of heavy conversations about the islanders who are afraid of what is coming. At the moment, it is not a pretty world for the feelings. This beautiful island offers so much solace but also causes my heart to bounce from ying to yang, from black to white, from positive to negative. The pendulum swings back and forth between happiness and sorrow, between quietness and rage, between life and death. Sometimes I feel quilty because I laugh, because I sleep, because I eat, because I live. But that does not make the refugees happy. So I put a smile back to my face, I sleep sweet dreams, eat tasty dishes and continue my life, that now that it's connected with the refugees, has taken another turn. I release my feelings making havoc. Gratitude moistens my eyes in seeing so many strangers who choose to come and help people, and tears will flow when seeing another dinghy arriving full of anxious eyes and screams. After all the waves have risen out of the blue water, and the beaches are left lonely places calling for the summer; the trees branches get softly lulled in the whispering wind, and the mountains silently observe. Life continues, I know; but time and time again this question rises: are you allowed to be happy in times of so much sorrow and misery? Brecht wrote the words in Denmark - as a fugitive from fascism i 1939. Brecht did cross the street ... took the short distance to Denmark where he lived as a fugitive for some years.